Making the decision on where to spend and where to save on a Disney trip is something I think everyone struggles with during planning. I often get asked if Mickey’s Very Merry Christmas Party is worth the expense. Since visiting Disney World is an expensive vacation it is important to know what you are getting in exchange for an extra paid admission. Mickey’s Very Merry Christmas Party (MVMCP) is a “hard ticket” event at Magic Kingdom that requires the purchase of an additional party ticket to attend. This event is billed as a way to experience the Magic Kingdom with smaller crowds and some unique experiences in exchange for the extra ticket cost. Mickey’s Very Merry Christmas Party takes place on select nights starting in early November through most of December. Find out specific dates and ticket prices here. The party officially runs from 7pm until midnight, but party ticket holders may enter the Magic Kingdom beginning at 4pm on their party night. Magic Kingdom will close to daytime guests at 6pm on Mickey’s Very Merry Christmas Party nights. Ticket sales are limited for Mickey’s Very Merry Christmas Party which means lower overall crowd levels. This is especially true if you are attending a party closer to Christmas Day as crowds get very intense over Christmas break and in the days leading up to it. Please note: not all attractions are open on MVMCP nights. There are several characters you can meet during Mickey’s Very Merry Christmas Party. Most of these are the usual Disney characters, but in their holiday best. However, there are a few special character meet opportunities such as Jack Skellington (as Sandy Claws), Santa, and Scrooge McDuck. Although we are character obsessed we generally spend less time on characters at Mickey’s Very Merry Christmas Party than we do at Mickey’s Not-So-Scary Halloween party. Please note: Some of the character meeting opportunities are rare and long lines will form even before the official party start. Make sure you plan ahead if this is important to you. Also character options are not guaranteed and available characters may change. 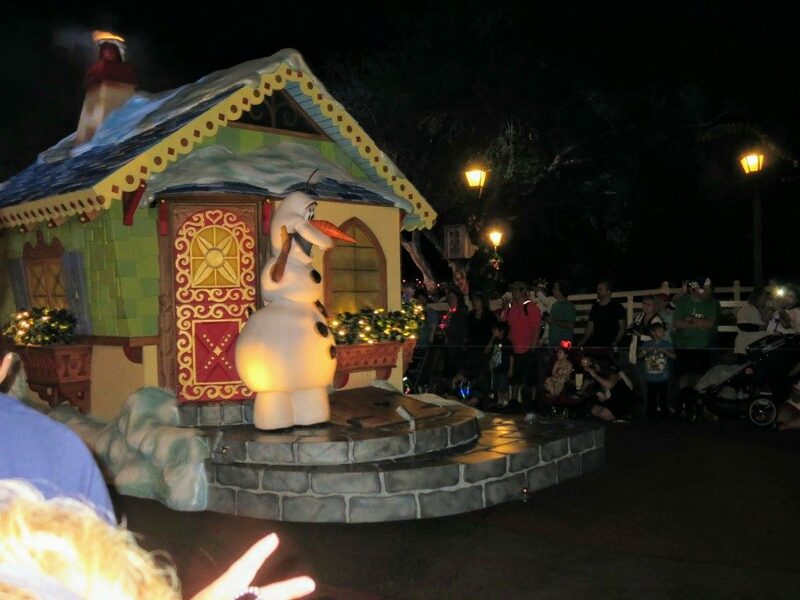 Mickey’s Once Upon a Christmastime Parade is my absolute favorite parade at Magic Kingdom (which is saying a lot). This parade has favorite Disney characters in Christmas themed floats that even smell amazing! 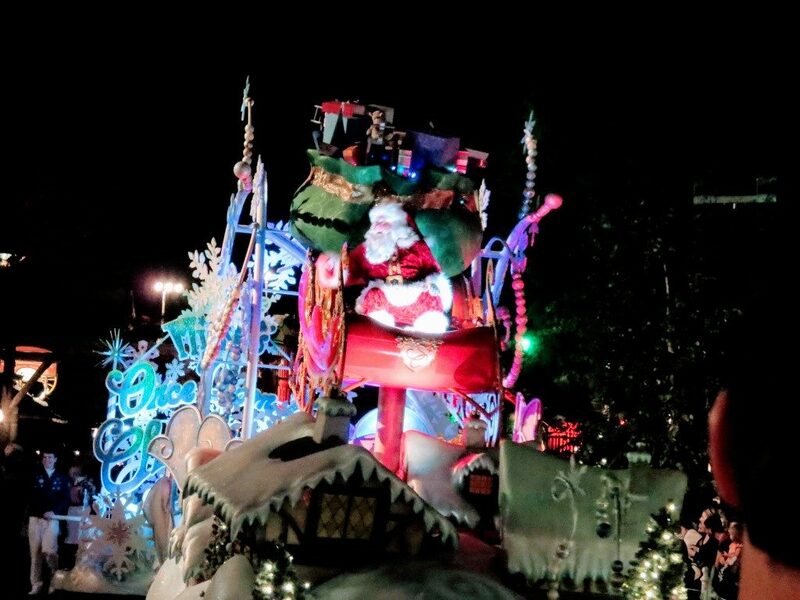 Mickey’s Once Upon a Christmastime Parade ends with Santa waving and wishing all a very Merry Christmas. Keep your eyes open for my favorite part of the parade: the marching toy soldiers! The parade is performed twice a night during Mickey’s Very Merry Christmas Party. I suggest securing a spot an hour or more ahead of the parade time if you want a premium viewing spot. This is a show that takes place (usually twice a night) in front of Cinderella’s castle. This show features Elsa, Anna, Kristoff and Olaf visiting a new land. 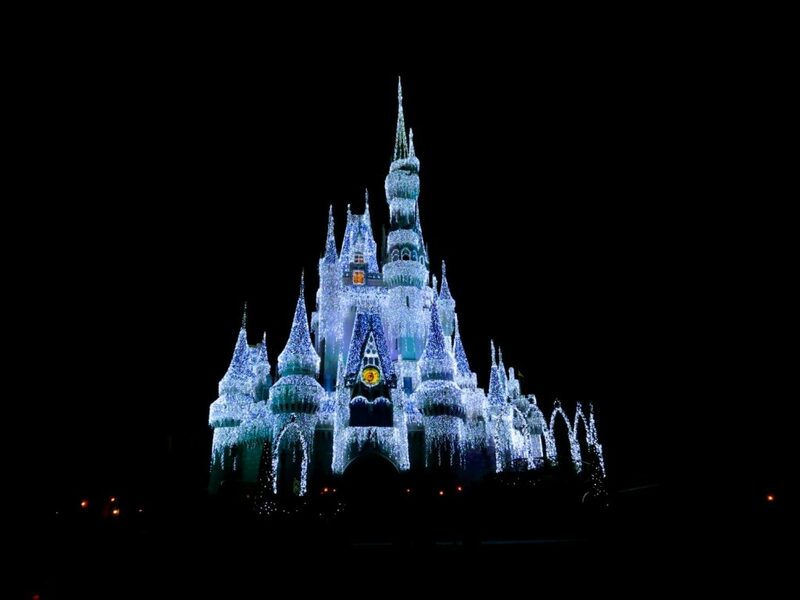 To help this land get into the Christmas spirit they suggest Elsa turn the castle to ice. The show is very cute and culminates in the lighting of Cinderella’s castle (which is breathtaking). This is another show that takes place on the stage in front of Cinderella’s castle. This show is about Mickey throwing a fabulous Christmas party with many Disney character guests and a dozen Christmas songs. All Magic Kingdom fireworks shows are amazing, and this one does not disappoint. The castle lights are turned off and beautiful projections are shown on Cinderella’s castle that tie in with the fireworks and music. During Mickey’s Very Merry Christmas Party several locations around Magic Kingdom provide free treats. Check the Disney website for specific venues and treats available for this year’s event. Can I Stay For Mickey’s Very Merry Christmas Party If I Spend The Day At Magic Kingdom? The short answer is no. Those who have purchased Mickey’s Very Merry Christmas Party tickets are issued special wristbands to show they are party guests. After 6pm on party nights those without wristbands won’t be allowed to enter queues for rides. Day guests must then make their way to Main Street to exit the park. A lot of people think that if you spend the day at Magic Kingdom you can sneak into Mickey’s Very Merry Christmas Party, but this is just wishful thinking. Cast members will ask to see wristbands as you walk around the park. You will be asked to leave if you do not have the special wristband for that night’s party. How Do I Get Dining Reservations During Mickey’s Very Merry Christmas Party? You must have a MVMCP ticket purchased and linked to your account prior to making dinner dining reservations on party nights. We usually opt for an early dinner on party nights. This means we eat during the overlap time of daytime guests finishing the day and party guests arriving. If getting a reservation for Be Our Guest or Cinderella’s Royal Table is important to you and this is the only time you can get it – go ahead. Otherwise I highly recommend using your party time for things that only occur during the event. Here is the special link to make dining reservations on party nights. Find out more about making Disney World dining reservations in my 5 minute guide. So Is Mickey’s Very Merry Christmas Party Worth It? A strong debate about whether the Mickey’s Very Merry Christmas Party was worth it took place at the Smart Mouse Travel house this year. We have a larger group going for my niece’s first Disney trip and we needed to consider the extra expense. Want to know about planning a group trip? Find more information here. I think if your kids are older, night owls, or live in a time zone where the late night party would not be a challenge I say to do it with one caveat. If cost is a concern I would not buy a regular park day admission on your party day. Instead I would suggest you rest at the hotel, take a tour around some of the on-site Disney World resorts or explore the Disney Springs Christmas Tree Trail. Use this saved money from one fewer park day to offset the cost of Mickey’s Very Merry Christmas Party. Get the most out of the party by arriving at 4pm to start the Christmas fun at Magic Kingdom. If you have younger kids or the additional cost is a concern skip the party. 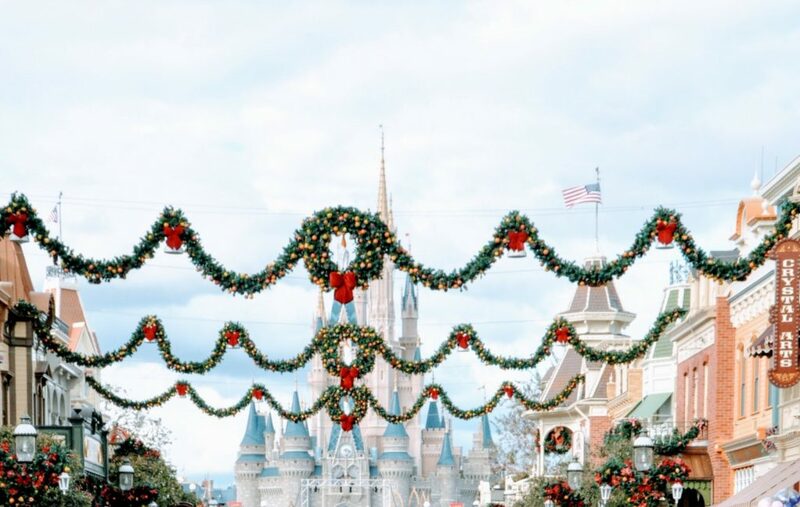 You will still be able to see all the Christmas decorations in the Magic Kingdom during a regular park day. Instead try to see the regular Magic Kingdom fireworks on a non-party night (still amazing) and take a tour of some Disney on-site resorts. Each resort has their own theme when it comes to Christmas decorations. 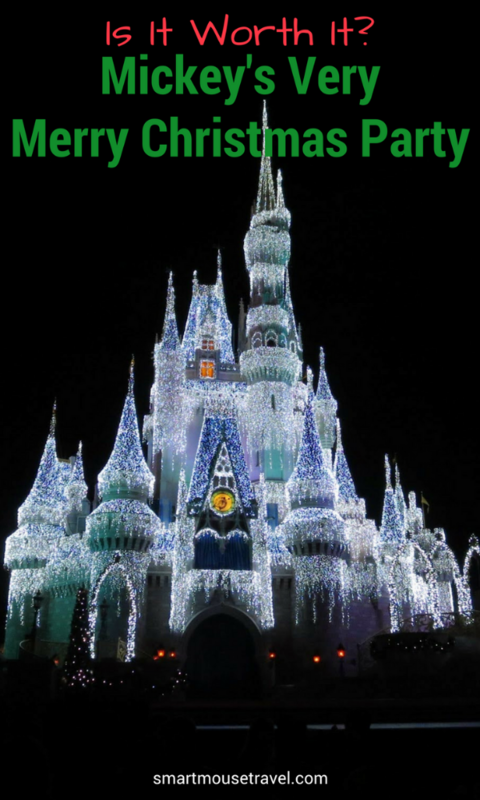 To see some more of our favorite Christmas activities at Disney World check out this article. I don’t have kiddos, but this sounds like so much fun regardless of how old you are! What an awesome holiday time activity, and I love your tips for tackling this activity with ease. Thanks for sharing! My family has been going to Disney for over 30 years. The parties used to be such a fantastic treat for all. This year we took my 5 year old to the Halloween Party to see the decorations and trick or treat. We are annual pass holders so over and above that cost, the party was another $100 a person and a very big disappointment. It was so over crowded that you could not move. I even took a tumble and fell after my foot falling in one of the railroad tracks. My granddaughter only got 3 pieces of candy because the treat lines were so long. Years ago they used to have a witch that flew down a wire from the castle at the Halloween party. They do not do that anymore. They used to have the spooky fog rolling around as you entered main street. They also had ghosts that lit up and flew around on main street. They quit doing that also. Basically it was a waste of money. We are going back to use our passes on November 30th and I am afraid to even attempt the Christmas Party. They have ruined it by letting too many people in each night to the special events. No one has fun when you are being walked on and pushed down. I’m sorry that you had a less than magical experience at MNSSHP! Certain party nights can have higher crowds than others. We find that in general there is so much to do during the party that it’s impossible to do it all, too. I hope that you have a better time if you try Mickey’s Very Merry Christmas Party. Thank you for sharing your experience. I agree that there seems to be almost no difference in crowds between the first and second parades these days, and crowd levels along Main Street before or after a parade can be overwhelming. The party crowds have definitely increased over the last few years. I’m not sure if Disney has increased the number or tickets sold or if people are just opting to do more parties. Even with the crowds we find lots of ways to have fun at Mickey’s Very Merry Christmas Party, but suggest that people with small children or price concerns skip it. I love Disney World and go at least once a year from Canada. I was thinking that I might try the Christmas party this year – but I’m so glad I read this blog. I think I would rather just buy a regular day ticket after hearing about the crowds at the party. Thanks for being honest and for the heads up about the MVMCP. I’m glad you found this review helpful! I think it is important to be honest so people are not disappointed in their Disney World experiences. I hope you have a wonderful visit during the Christmas season. There are so many ways to experience Christmas magic for free at Disney World by touring the resort hotels and the Disney Springs Christmas Tree Trail.